Kimberly White/GettyLinkedIn SVP of Global Talent Organisation Pat Wadors. Its management culture has been shaped by its founder and chairman Reid Hoffman, its CEO Jeff Weiner, and its head of HR, SVP of Global Talent Organisation Pat Wadors. Wadors spoke with Business Insider earlier this year, and she told us that there is a set of criteria that every manager at LinkedIn is judged on. They apply to any leader at any organisation. These are the behaviours the best managers at LinkedIn exhibit. In his 2014 book “The Alliance,” cowritten with Ben Casnocha and Chris Yeh, Hoffman rethinks the relationship between managers and employees, explaining how employers can attract and retain the best employees through the formation of alliances where everyone wins. Key to this approach is managers recognising that the days of lifetime employment are long over, and that their employees won’t stay with them forever. At LinkedIn, Wadors said, the best managers push their employees to constantly grow and develop with new challenges and learning opportunities. Rather than waiting for the annual review to reveal insights into an employee’s performance, managers constantly keep a dialogue open with their team members. 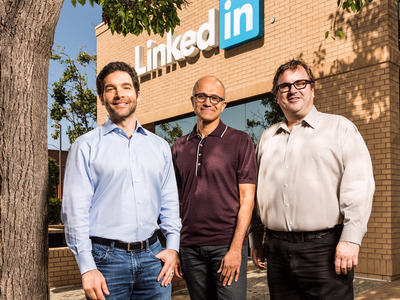 MicrosoftLinkedIn CEO Jeff Weiner, Microsoft CEO Satya Nadella, and LinkedIn founder and chairman Reid Hoffman. LinkedIn’s culture incorporates the Silicon Valley ethos of not being afraid of failure, in the sense that if an experiment fails, it should be evaluated for lessons that can be immediately acted on, without stopping to mourn the loss. And finally, the best managers exhibit all of the behaviours they demand of their employees.